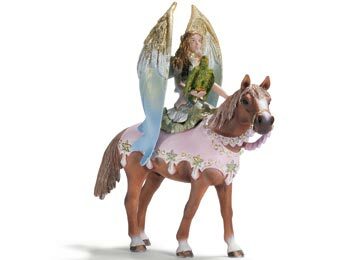 Surah shows off wings tipped in gold as she rides her pink-backed horse. When Surah awakes, for a moment she is unsure as to what has happened. Only once she catches sight of the face of her long lost sister does her pale face light up with a relieved smile. Her nightmare has come to an end. Her captivity, her voyage of adventure to Oracle Mountain, her rescue and the reunion with her twin sister. Surah is happy again. And look how she has changed! The eerie pallor of her skin has given way to a lively colour; her wings are shining a radiant blue with accents of white, green and shimmering gold tips. When she flies over the sun-drenched meadows and forests around the elves' home Summer Green, she is more beautiful than the most beautiful birds in the land. And wherever Surah is, the birds are too. Wherever she is, her feathered friends twitter and flatter around her and the whole world is lit up with joy. And when one day her best friend, a little green bird, returns to her, her happiness is complete.